The past is history, my arse. The release of Human Revolution has demoted Invisible War from Deus Ex 2 to footnote curio. And since Eidos Montreal turned Thief into an anti-open world, Ion Storm stablemate Thief: Deadly Shadows has suddenly become essential. With an unusually good sense of timing for a mod, here comes Thief 3 Gold to remove Deadly Shadows’ most tangible misstep: its loading screens. 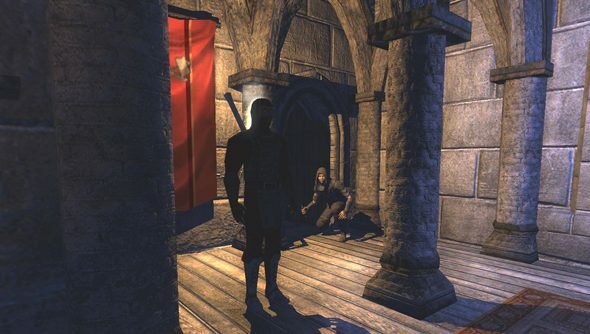 Modder Beleg Cúthalion has succeeded in surgically removing the loading zones and blug fog that pockmarked all nine of Thief 3’s proper missions. He’s replaced them with redesigned transition zones “as faithful to the game as possible”. Beyond that, he’s fixed some broken guard patrol routes and tweaked the game to better fit the philosophy of the Thief community at large: there are now no AI in positions that might make a map unghostable. And there’s no longer a requirement to steal Widow Moira’s inheritance on Expert – as making off with the old dear’s money yields consequences later in the story. What Cúthalion won’t be able to do is correct Deadly Shadows’ missing rope arrows or swimmable water – because despite his LOTR-sourced moniker, he’s not a sodding wizard. A worthy effort though, wouldn’t you say? Time to revisit the Cradle. Right after I’ve sent these emails. And didn’t the ironing need doing?